There have always been a lot of questions in the Help Desk about how people can't find where to edit the CSS, since most people don't know how overrides work and expect to just edit code. Ever since CSS was moved from being an @import within a <style> element to being linked (a good change overall), there have been even more such threads than before. In addition to being confusing, it also means that any custom CSS must be a part of the Overall Template, where it can't easily be cached (it's cached as part of every page, rather than as a separate file), defeating the purpose of having the CSS in a separate file. In addition, all those overrides are probably a waste of CPU cycles. I propose a very simple solution: Have each template's CSS as an editable "template section". Each default template's CSS would populate this section the same way all the other sections are populated when you load a default template, instead of being an inaccessible file. I am not sure how the template stuff works, but perhaps the CSS can be generated just once as a fixed (and cacheable!) file (templateID.css) every time it's saved, instead of being generated dynamically from the database at page load time like the other template sections are. I don't expect there to be CSS variables, just put that in the mockup because it wasn't any extra work. However, they could one day be added to allow code-free minor editing of templates by having a page where a few basic variables used by the CSS can be set. These could be colours and URLs of banner images, nothing fancy. 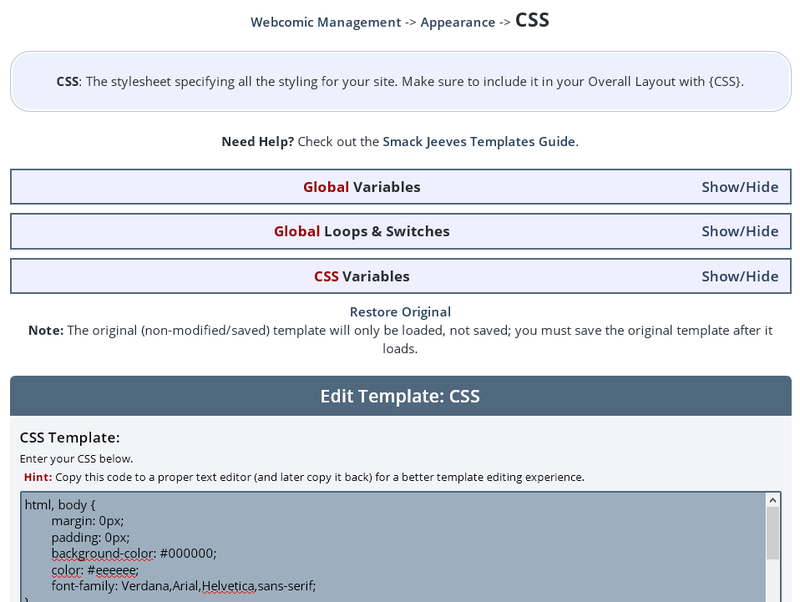 Yes, I know you can insert CSS in your template's overall page. Depending on the size of your stylesheet, this can increase each individual page size by a not-insignificant amount. On an archive binge, this can slow load time, and may produce additional unnecessary overhead because each comic page being served up is larger. While the last two options are certainly feasible, it would just be really nice to be able to just have a "Custom CSS" page as part of the Page Design/Appearance section. Since users are already entering it in as part of the template, this would help out with reducing individual webpage sizes, which, with the size of some comic archives, can significantly reduce load time and bandwidth usage, since you'd be loading one CSS file that could be cached, rather than the same set of css for pages comics/$comic_id1 and comics/$comic_id2, etc due to its inclusion in the template. I already suggested this here. Shall I merge the two threads? eishiya wrote: I already suggested this here. Shall I merge the two threads? Yes, please! I'd somehow missed that in my search before making the suggestion. Done! That we came up with identical solutions to this issue is probably a good sign. Voicing my support for this! I'm currently hosting my CSS off site because it's easier to be able to edit it directly where I have the CSS hosted, rather than uploading a new file manually for every change. Something like this would make life easier for the person I have helping me with my site stuff. Even if it were like a subscriber feature, it would give more incentive to subscribe to have that ease of use and not have to outsource CSS. Darkhalo4321 wrote: Something like this would make life easier for the person I have helping me with my site stuff. Even if it were like a subscriber feature, it would give more incentive to subscribe to have that ease of use and not have to outsource CSS. You can currently use inline CSS by placing it in a <style> tag in your Overall Layout, so you don't need to use external CSS.